There are many individuals that contribute to the SlotsOnline.com website. Some have a writing background, but most of us are just slots fanatics, see below for our individual profiles. If you'd like to contribute to the website, just contact us or send in your article. Hey, my name is Allison Macintosh and I'm the editor for SlotsOnline.com. I've been a slot fan for as long as I can remember. My earliest memory is of putting nickels in a vintage one armed-bandit hidden in my grandparent's basement. I wasn't even tall enough to play properly and had to stand on a rickety wooden chair to reach the lever. Nevertheless, the spinning reels and excitement when that machine started spitting shiny silver nickels has stuck with me, making me a life long slot fan. The fun graphics and flashing lights are all appealing, but it's the simplicity of the games that keeps me coming back. I started SlotsOnline.com to pay homage to my favorite casino game, and to inform all types of players of the ease and convenience of playing online slots. Now, with the help of a few friends, we've ventured to review every online slot out there. We've also aimed to provide players with a hub of information that contains reliable slot reviews, online slot guides, and slot news for everything that has to do with slots online. It's a labor of love, but completely worth it when I see players spinning in huge wins at online casinos across the Internet. 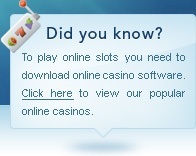 So, have a look around to find out more about how and where you can play online slots. And, don't forget to contact us if you have a question or suggestion for the site. We're always anxious to hear from our readers! Emmily discovered slots upon making her first venture across the casino floors about four years ago. Since, she has developed a keen understanding and love for these classic casino games and spends plenty of time making the rounds at all of our recommended online slots casinos looking for new games to try out. As our resident blogging expert, Emmily spends the rest of her time keeping everyone up to date on online slot news. Check out our slots online news blog for her latest work. 5 reel online slots as they offer players the most in extra bonus games. Because of his fondness for online slots, he enjoys spending his time reviewing as many games as possible. Check out a few of our online slot reviews and you're bound to find one of Simon's favorites. He's a huge fan of real life slots as he's been spinning the reels for nearly a decade. His love of the game is so strong that he makes an annual journey to Las Vegas to indulge in all of the latest slot machines across the casino floors. Between visits, he enjoys putting up reviews of his favorite online casinos, such as Go Casino and All Slots. He puts a lot of effort into reviewing every online slot he has the pleasure of playing, as he loves spreading the word on a great online slot. Lucy lives by the idea of trying out everything at least once. This is something that carried over into her love of online casinos as she enjoys playing all different types of online casino games. From Blackjack to Keno, she flipped the cards, rolled the dice, and selected the numbers. She counts slots and online video poker among her favorites as there is little out there more thrilling than hitting a big win on either of these online casino games. She's been spinning the reels for more than a decade, and, as the resident expert on all things slots, Carlie spends a good deal of time overseeing all slot content on the site. Whether it's free slots or slot tournaments, she's happy to spend her days researching and reviewing every online slot subject. Feel free to have a look around the site to read through Carlie's helpful slot guides. Then get to her favorite online casino - Crazy Slots - to put it all to the test.